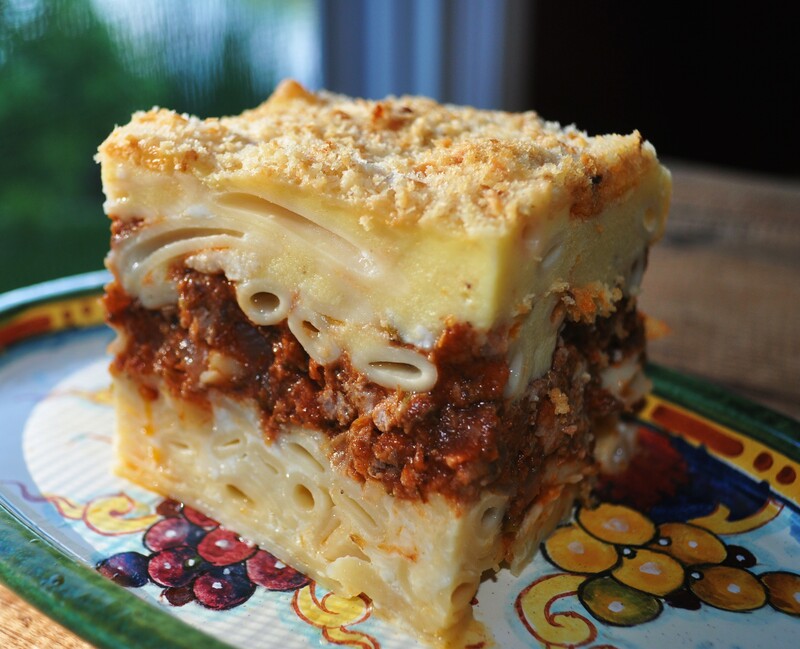 Pastitsio: Greek Lasagna in the Instant Pot | The Sassy Spoon: Fun Food! Pasttitsio is full of flavor and texture and made much quicker in the Instant Pot! This recipe is so good that I revisit it every few months. It makes a great centerpiece for a dinner party and the leftovers are better than the first night’s meal. With the Instant Pot there are not as many leftovers, it makes a smaller amount, but I like that since we typical feed two to four at our house. If you want to make it the traditional way for a larger number of people, click here. The noodles are difficult to find, but I get them on Amazon.com, buying 6 bags at a time. 1/2 pkg. #2 Macaroni for Pastitsio (500g)- available at Greek or ethnic groceries. This recipe will yield about 4 servings depending upon the size of your pieces. I use a 6″ spring form pan that is 3-4″ deep. Brush the bottom and sides of the spring form pan with olive oil. Layer the bottom with half the pasta noodles and press down so that they are somewhat flat. Pour the bechamel over the pasta noodles making sure to pour sauce down in to the corners as well. I even pull back the sides of the pasta to let some go down the sides. Sprinkle with remaining 1/2 cup of grated Parmesan cheese and bread crumbs if desired. I make a foil sling for the spring form pan to make it easier to remove from the IP. Process in IP on high on rack for 18 minutes using instant release. remove from the pot and place on a sheet pan. place under broiler on low to toast the topping. allow to rest for 15-20 minutes before cutting.